There is a kind of tiny insect named lac insect. They often parasitize on the branches of certain trees in the tropical and sub-tropical areas. The young ones like to imbibe the tree liquids, then secrete a purple sticking liquid, which would congeal and stick to the trees. People call it purple liquid glue; which, after proper processing, would become very good industrial bonding agent. 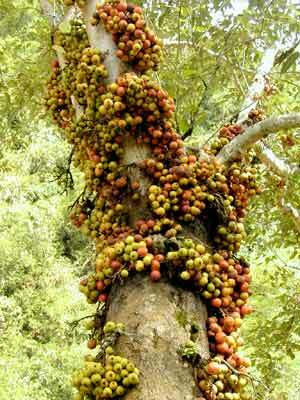 In Xishuangbanna, Cluster fig is a superb tree parasitized by such insects. Cluster fig is a sort of evergreen arbor tree. It could grow as tall as 25-30 meters with a chest diameter of 60-90 cm. It has numerous fruits and the fruits often hang in the branches in strings. Besides, the fruits have different colors in different period of growth; sometimes they are red, sometimes yellow, and sometimes green and sometimes blue; and most people are fond of them. When ripen, the fruits are sweet and tasty, and make people gloat over them. Cluster fig trees are mainly grown in Guangxi, Yunnan, and Guizhou; they like to grow in humid districts, and are often seen in areas along rivers and streams; and we can also find them in India, Srilanka, Nepal, Vietnam and Thailand etc.